on January 23 & 24, 2016. Hours are Saturday 10am to 5pm and Sunday 12pm to 5pm. Visit us and meet Connie Hoffman, our Venue Manager. Learn about our exciting new, wedding event venue – An 1840’s Historic Barn in nearby Delaware Ohio. 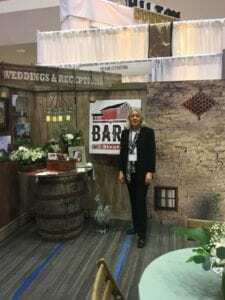 You will love our fully decorated Barn Weddings Booth. The Barn at Stratford, with its barn decorated show booth, was busy from the opening bell until the show closed. Hundreds of brides, grooms, family members and friends came to see this exciting new Barn Wedding venue. Connie Hoffman – Venue Manager, was happily busy each day greeting guests and showing them all that The Barn at Stratford offers as a wedding venue. Everyone loved majestic stone walls and hand-hewn beams of the 1840’s barn. They were surprised to find in-barn restrooms, heat and air conditioning, electric power, a full prep kitchen, a sound system and WIFI! All that with a convenient Central Ohio location in nearby Delaware Ohio. Thank you for making The Columbus Weddings Show 2016 such a grand event for The Barn at Stratford. We look forward to giving you a personal tour of the barn and the six-acre historic homestead.